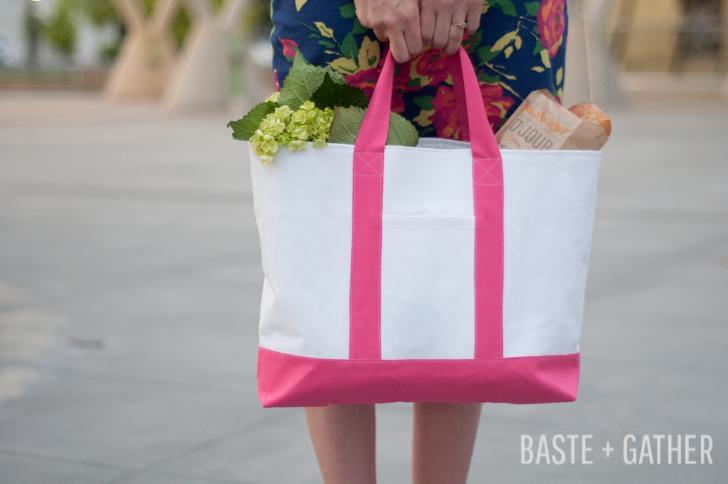 Everyone needs a basic tote pattern in their stash - and I have the perfect one for you! I created this pattern and tutorial for Janome and based it on a vintage pattern I had as well as several popular models sold today in iconic catalogs. Sewn with canvas or thick twill fused to a decorator-weight interfacting and lined with your favorite quilting cotton, this will quickly become your go-to bag for lugging around your everyday essentials. It's also the perfect beach bag, pool bag or all-around-kid-stuff bag! To get the free pattern and tutorial, visit the project page on Janome.com. Enjoy! When Caroline of the popular sewing blog/pattern company Sew Caroline contacted me about participating in the tour for her new fabric line, Gleeful, I was ecstatic! Caroline has become a great friend over the past few months, and pretty much anything she creates is fun, colorful and beautiful (just like her!). I asked for a yard of "After the Rain" in voile. Oh girls. Let me tell you - this stuff is heavenly! It has beautiful drape and is SO, so soft. And you know, some really soft fabrics get kind of fuzzy and lose their saturation after washing...but not this one! It is still the most heavenly blue color even after LOTS of wear by this little girl. I whipped up this little number for Harper using the fabric Caroline sent, and I just adore her in it. The color is perfect with her skintone and blue eyes, and it was super easy to sew up. 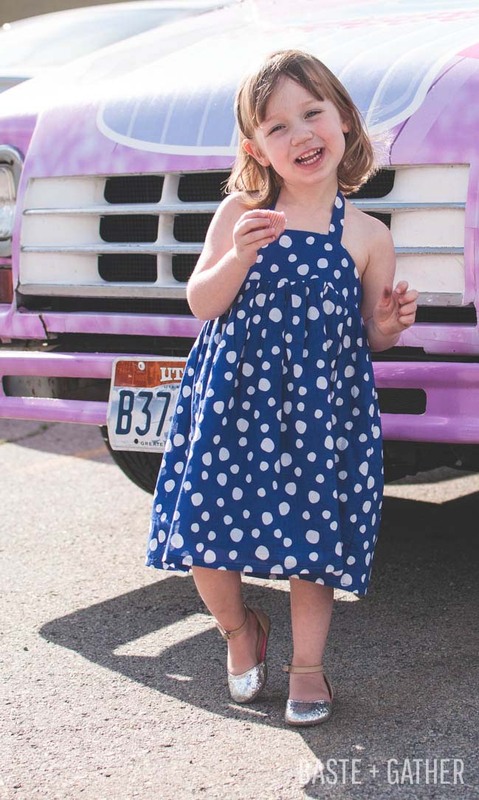 We did our little impromptu photo shoot in the parking lot at So Cupcake in Salt Lake City. 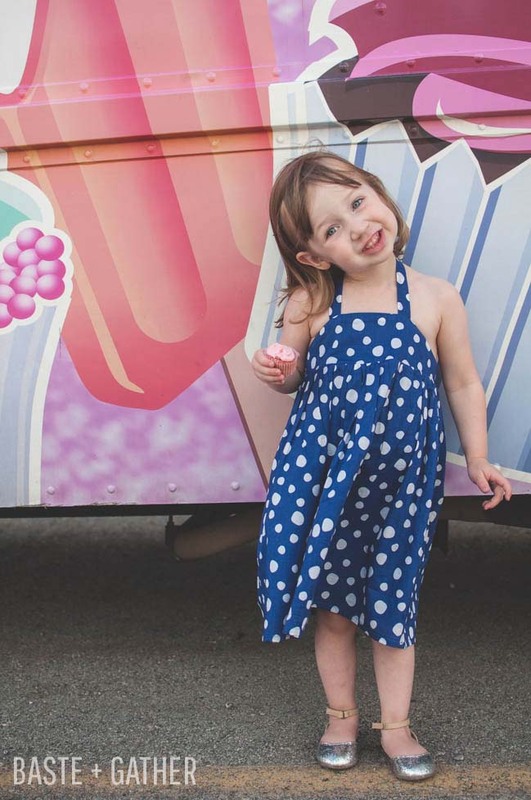 I took her there to get a cupcake to (hopefully) bribe her to go somewhere outdoors and take photos, but then, we spotted this ice cream/cupcake truck and KNEW it was the perfect location! So, I present to you the Cupcake Dress! It's a simple silhouette with elastic in the back for a comfortable fit, ties around the neck and a gathered skirt. It can be fully lined or just lined in the bodice depending on how sheer your main fabric is. For this version, I fully lined the dress with sheermist batiste from Hancock Fabrics. They had a royal blue that almost perfectly matched the main! And hey, the best part? You guys get a free pattern! The bodice prints on just two pages and is available in sizes 12M-8. For the skirt and straps, you just have to cut some rectangles. THANKS SO MUCH to Caroline for inviting me to participate in her tour! Ready to sew a Cupcake Dress?! 1. Fold straps in half lengthwise with RIGHT sides together and press. Stitch around all but one short end with a 3/8" seam allowance. Trim seam allowance 1/8" from stitching - OR - if using a very lightweight fabric like I am, you may leave the seam allowance to give the straps a little heft. Turn straps right-side-out; press. 2. Pin straps to the RIGHT side of the front bodice piece as indicated on the pattern. Match up the raw edge of the straps with the raw edge of the top of the bodice front. Baste in place. 3. With RIGHT sides together, sew bodice front to bodice lining along top edge only. The straps will be sandwiched in-between the two layers. If desired, you may reinforce the straps with a second line of stitching on the seam allowance and close to the first line of stitching. 4. Fold back bodice piece in half lengthwise with WRONG sides together and press. 5. Stitch a line 1/4" away from the folded edge. Stitch another line 5/8" away from the raw edge. Finally, baste (use a wide stitch that will be removed later) another a line 3/8" away from the raw edge. 6. Insert one piece of elastic in the casing you just created along the top of the back bodice piece using a small safety pin or bodkin. Carefully tug on the elastic until the end of the elastic meets with the edge of the casing. Stitch that end in place. Remove safety pin/bodkin, and repeat for the other side. 7. Insert second piece of elastic into the casing at the bottom of the back bodice piece. Stitch the ends in place as you did for the first piece of elastic. 8. Open up the front bodice, and insert the back bodice into it. The back bodice piece will be sandwiched between the main and lining of the front bodice and touching the right sides of the front bodice pieces. Line up the side edges of the front bodice pieces with the back bodice piece. Make sure the back bodice piece is jammed all the way up there so the side seams will be even when everything is turned right-side-out. Using a 3/8" seam allowance, sew bodice pieces together at the side seams. 9. Turn bodice pieces right-side-out and press. You may clip curves along the front bodice if needed to make it lie nice and straight. 10. With RIGHT sides together, sew skirt pieces together at side seams. Serge, zigzag or pink seam allowances, and press toward back. Repeat for lining if you have chosen to include one. 11. Baste a wide stitch along the top edge of the skirt using a 3/8" seam allowance for gathering. Baste a second line of wide stitches using a 1/4" seam allowance. Grabbing only the two top threads at the beginning of the stitches you just made, pull to gather the skirt. Repeat for lining if you have chosen to include one. 12. With main side of bodice touching RIGHT side of skirt, pin skirt to bodice, matching side seams and center notches. Adjust skirt gathers evenly to fit. 13. If including a lining, you will now pin the right side of the lining to the lining side of the bodice, sandwiching the bodice between the skirt main and skirt lining. Adjust gathers evenly to fit. 14. With a 3/8" seam allowance, sew skirt and optional skirt lining to bodice. Try to keep a very accurate seam allowance on the back side so you don't catch the elastic in the stitching. Don't stress too much if you do, though. :) Serge, zigzag or pink seam allowance. 15. Flip the skirt and optional skirt lining down, and press seam allowance up toward bodice. Almost done! 16. Turn bottom hem under toward wrong side 1/4" and press. Then turn it under another 1/4" and press again. Sew hem in place. Repeat for lining if you chose to do one. 17. Give everything one last press, and put that dress on a little girl! Adorable, right?! Okaaaaaaay, folks! I'm not gonna lie; I have an ulterior motive with posting free sewing patterns: I want to grow my blog! I would l-u-r-v-e for you to help me by following my blog on Bloglovin', pinning this post on Pinterest, sharing on Facebook, clicking through my social media icons above (and following) etc. So please, if you want to keep seeing free sewing patterns (and I have quite a few in the works! ), PLEASE help me out! Mmmmmmkay?! 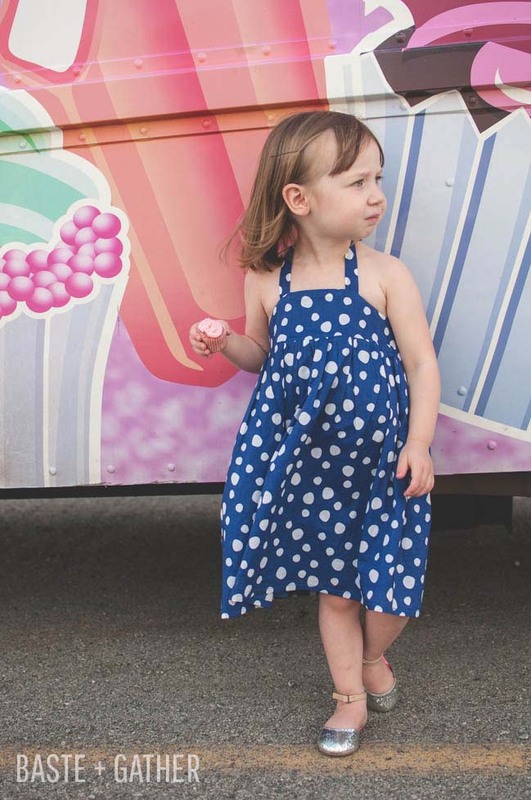 xoxoxo I am super excited to release a free sewing pattern today - Summer Shorties! These shorts were originally designed to go under little girls' skirts and dresses for added modesty on the playground when climbing jungle gyms and doing cartwheels, but I've found them to be a super versatile garment for playtime, dancewear and more! One of my testers (yes, I fully tested this pattern even though it's free!) even suggested that they would make great boxer briefs for little boys. Perfect! You could even make them a size or two bigger than suggested by the size chart (while still using the correct length of elastic) to create a more relaxed-fit pair of shorts. Shall we? Made with plush-back or fold-over elastic at the waist, these are easy to whip up in just a few minutes (yes, you read that right) and only require four pieces of paper to print. They come in sizes 12 months through 8, and you can choose to print just a size or two if you want! Like I mentioned before, this pattern has been fully tested and was created with the same attention to detail as my paid patterns. So, I know you're drooling over these fabulous knit fabrics, right? I KNOW. They were all provided by Wanderlust Fabrics - probably the hippest online fabric store I've found...um...EVER. So be sure to hop over there to check out their amazing selection when you're done here. Or, you know, do it NOW because you are going to need some fabric for your million pairs of SUMMER SHORTIES! We had a ball with this photo shoot...as you can see. Harper just loves all the fun prints! They are super soft and comfy, too. 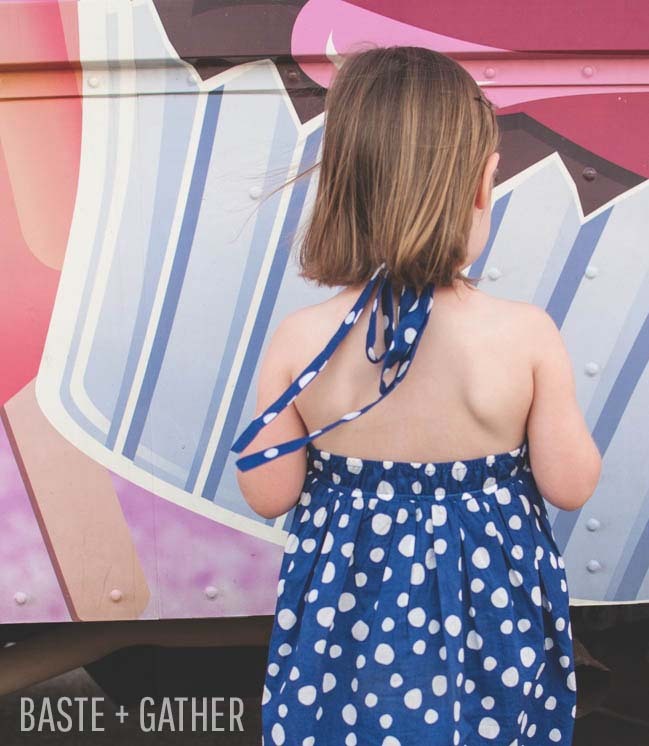 So are you ready to make some Summer Shorties for your little girl (or boy)? Let's get started! 1/2 yard of stretchy knit fabric - 4-way stretch is preferred but not required. Just think about the fabrics leggings are made of. That's what you want. Oh, and you can actually make two pair from a half yard of fabric...but you can't usually get fabric cut with the selvage, so you need a half yard if you are buying some for these. Otherwise, you can probably get by with some small scraps from your stash. 3/4" plush-back elastic OR 1" fold-over elastic. You'll need the length of your child's waist measurement. Sewing machine, thread, scissors, pins, iron, yadda yadda yadda. You know, the usual stuff. Next...let's pick a size! CHOOSE YOUR SIZE BASED ON SEAT/HIP MEASUREMENT. These sizes are much like what you would find in RTW clothing at popular children's clothing stores like Old Navy or Carter's. 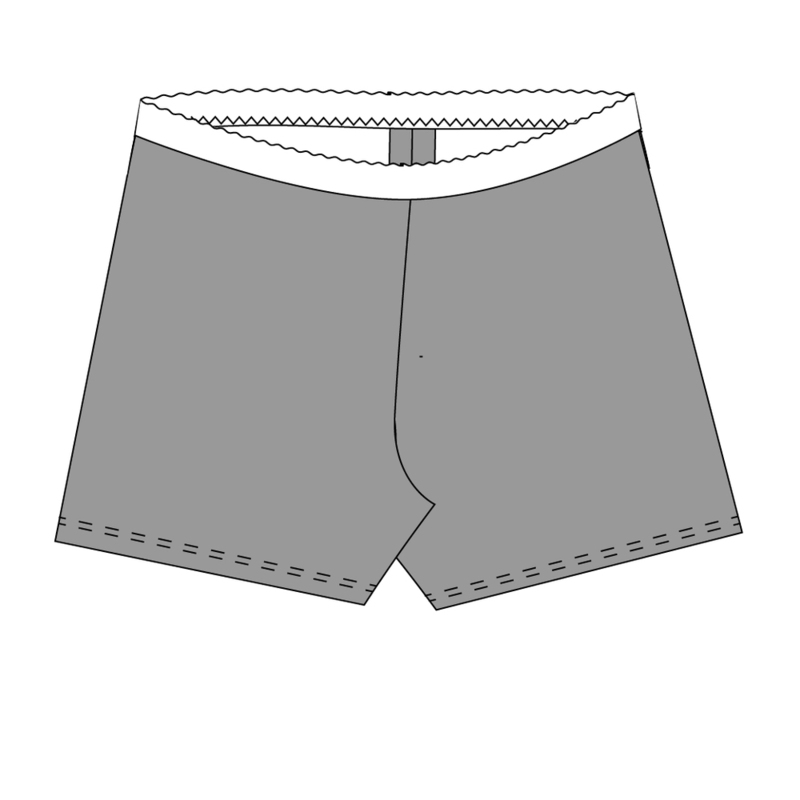 If your child has a particularly rotund bottom, I recommend sizing up as the shorts are cut with negative ease and can be drawn in at the waist with the elastic. You might also size up if your fabric isn't particularly stretchy (or down if it is). Please also note that these shorts do NOT include a diaper allowance. So if you're sewing these for a kiddo still in nappies, you might want to increase the rise slightly. Harper (shown in the photos) is 35" tall/28 pounds and has a 21" waist/21" seat. She is wearing the size 2 with the fold-over elastic cut to 18" (17.5" after sewing in a loop). And now, let's get sewing! 1. Press bottom hem up 5/8" toward the wrong side. We won't be sewing this just yet, but it will make it a lot easier to do so in a bit. You just want to make a crease there so we can see where to fold up the hem once the legs are loops instead of flat pieces. 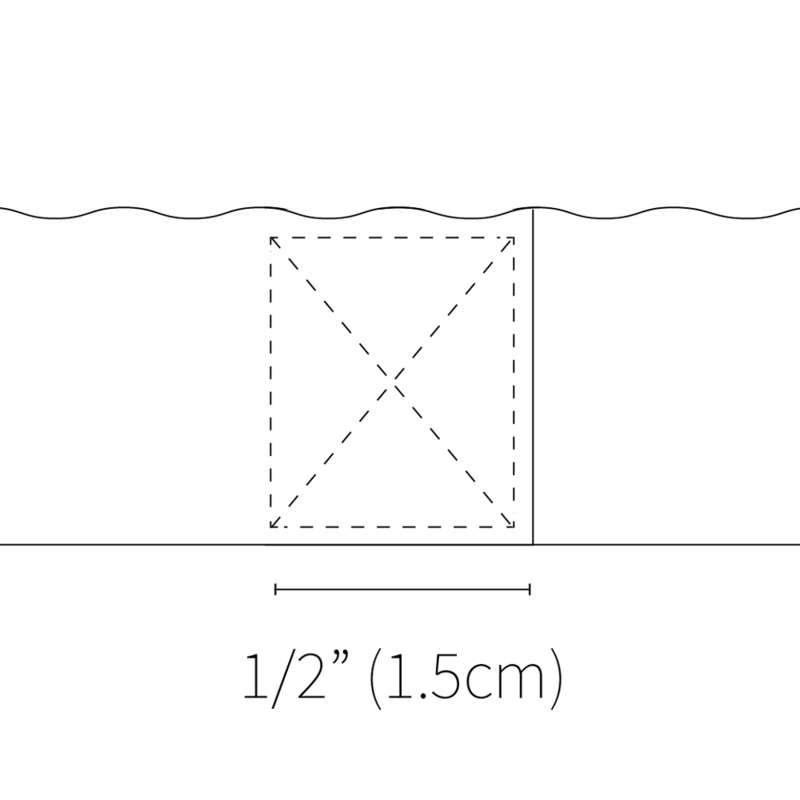 This step is not shown in the illustrations below. 2. With right sides together and using a stretch stitch or serger, sew front and back crotch together with a 3/8" (1cm) seam allowance. Press seams open or to the back if serged. 3. With right sides together and using a stretch stitch or serger, sew the inseam together with a 3/8" (1cm) seam allowance. You may sew a second line of stitching if desired to prevent blowouts! Press seams open or to the back if serged or sewn a second time. 4. Determine how long to cut your elastic by simply putting it around your child's waist just below the belly button. Make sure it's relatively snug (but not too tight) and overlapping by 1/2". Cut the piece, and measure it so you can cut more for future Summer Shorties without having to keep bugging your kiddo! I also melted the ends of the elastic with a lighter to prevent them from raveling. Overlap the ends by 1/2" (1.5cm) and sew them together as shown. If using plush-back elastic, you might end up with a longer piece than if using fold-over elastic since it's a little more dense and doesn't stretch as much. 4. 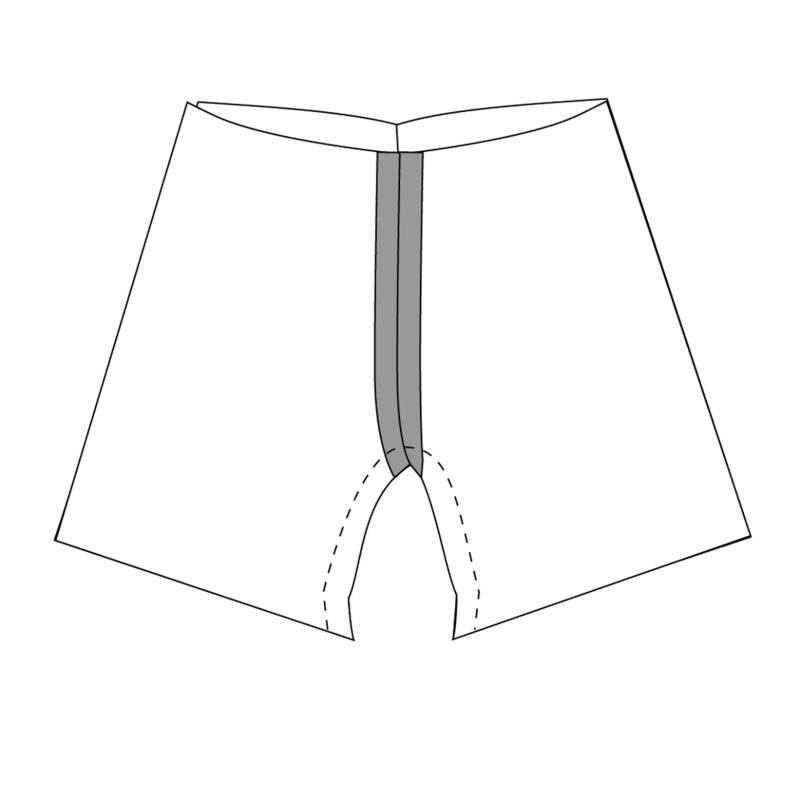 With right sides together (plush side of elastic facing away from fabric and toward you) and using a wide zigzag stitch or serger, sew the elastic loop to the top of the shorts with a 1/4" (.5cm) seam allowance. Match the spot where you joined the elastic ends with the back seam of the shorts. You may also fold the elastic and shorts into fourths to mark the centers/sides for perfect matching, but it's pretty easy to get them matched up properly without doing so. You may also pin the elastic to the shorts if desired, but I am lazy and skip this step! 5. Flip the elastic up. So pretty and comfortable-looking, right?! Turn the bottom hems up by 5/8" (1.5cm) and sew in place. Remember how we creased those hems in the first steps? Ahhh, makes this part so easy. I recommend using a double needle or coverstitch machine if available. Otherwise, you may use a stretch or zigzag stitch. 6. If desired, you may choose to topstitch your elastic to the top of the shorts so it doesn't flip out annoyingly. (Some of my testers did this.) Totally up to you. So super easy and awesome, right? Now go put those Summer Shorties on a kid near you and cartwheel all summer long! And of course, thanks to Harper for being a good sport, always!